David Guzman couldn't go for Portland due to injury, but Andres Flores filled in. Portland - Seattle matches have a contentious feel to them regardless of the situation or stakes, as we've witnessed in the 5 preceding meetings (1 preseason match, 3 regular season matches, 1 playoff match) between the rivals, but there was more tension heaped on the second leg due to certain circumstances. The match itself had to be moved up 3 days from the original kick date of November 11 due to a facilities conflict with the Sounders FC home pitch (The Seahawks had a home game on November 4 while an international car show was scheduled from November 9 - 11 on site), so it was slated for Thursday, November 8 which compressed the legs for both teams. While Seattle had to feel good about being within a goal and having the road goals advantage, they lost 2 key players in Chad Marshall and Cristian Roldan due to injuries in leg 1, and neither would be available for the return trip. Portland's offense had moments of pure brilliance in leg 1, but they had to feel slightly nervous getting just 2 goals at home despite having several great chances to add to their lead. 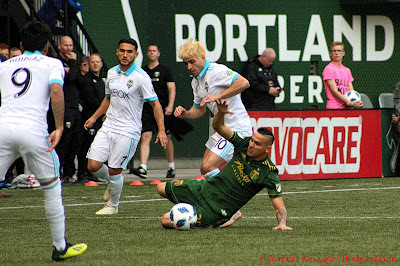 Portland also had an injury issue of their own, as midfielder David Guzman was unavailable for leg 2 after knocking heads with Seattle's Gustav Svensson on a 1st half corner kick. Guzman left the match in the second half after feeling dizzy, but apparently his hamstrings had been giving him concern; David has been one of the consistent players down the stretch for the Timbers. Timbers Coach Gio Savarese had some decisions to make about replacing Guzman, but in true form, Gio made other adjustments to his side to see if they could secure the series win. Savarese made 3 different adjustments to his starting eleven from leg 1. Jeff Attinella again started in goal with Steve Clark as his backup, but the defensive line got several adjustments. 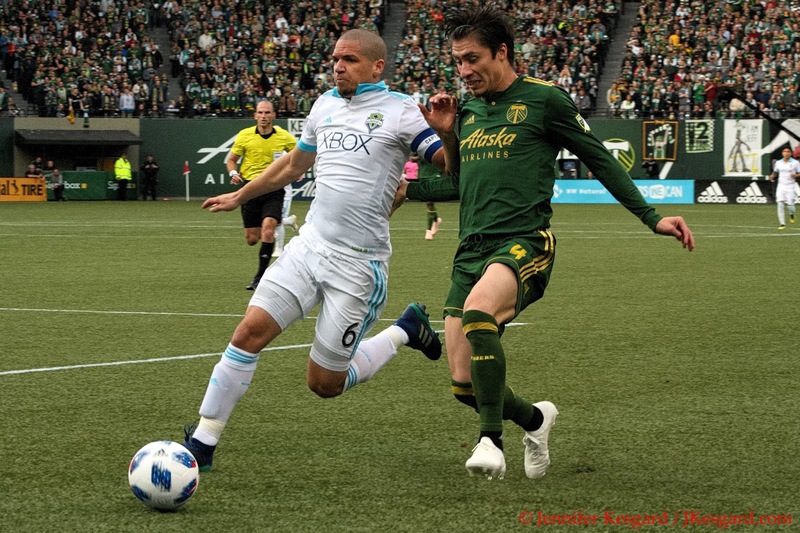 Larrys Mabiala, unavailable for leg 1 due to suspension, was back in the starting eleven alongside Liam Ridgewell with Jorge Villafana manning the left back spot. Instead of Zarek Valentin at right back, Savarese gave Alvas Powell the start with Valentin and leg 1 starter Bill Tuiloma on the bench. With Guzman out, Savarese gave Andres Flores the start in the midfield with Andy Polo and Diego Chara, with Blanco and Diego Valeri as the attacking mids and Jeremy Ebobisse as the lone striker. Savarese had Lawrence Olum, Lucas Melano, and Julio Cascante available as needed depending on the situation, but for the Timbers, the moves would likely be determined on the situation happening on the pitch at the time. Seattle kept things relatively straightforward as well, using most of the same players from their leg 1 starters, but replacing Roldan with Harrison Shipp and Roman Torres filling in for Marshall. Striker Raul Ruidiaz has been difficult for most defenses to deal with since he joined Seattle midseason in 2018, and so the Sounders had to feel confident in their chances offensively with Raul attacking and a rabid partisan crowd cheering them on. Despite it being a midweek match and no organized bus caravan transporting folks up north, there was a large traveling contingent of Timbers Army that made the trip to support their side and provide vocal, energetic support of their charges. I haven't made a habit of going back to read my work at the previous site, but I admit that being there live, it was difficult to capture all of the competing emotions going on that Double Post night. Even watching a documentary film put together by MLS, while certainly impressively and thoughfully done, couldn't completely capture everything that I felt on that chilly evening back in October 2015. It's hard not to see complete parallels between the two matches despite the differing locations and participants - a first half of teams trying to figure out a master plan, a second half where a team takes an advantage only to see it countered rather quickly, and then a crazy extra time frame that led to penalties. I wouldn't say that Savarese's approach in the first 45 minutes was conservative, but it was in so much that both teams were still trying to build the chemistry and tempo needed to find a break, and with the stakes of the match essentially being a single goal, getting the first tally would be paramount. Yet when Ruidiaz knocked in a shot when Attinella had trouble handling a rebounding ball in the 68th minute, I still felt there were plenty of goals in the match. Sure enough, Asprilla replaces Polo in the 72nd minute and within 4 minutes, Dairon made a play for the ages in settling a cross from Villafana on the right side. 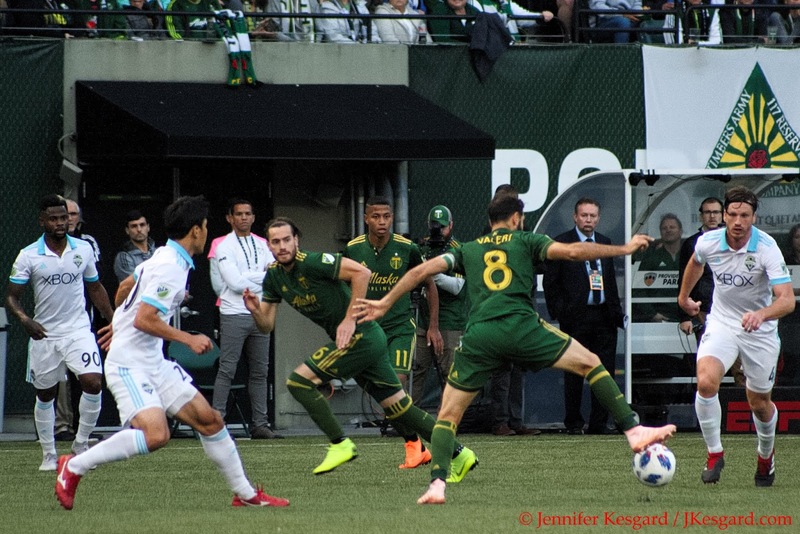 His deft footwork settled the ball for Blanco, and Seba did the rest to level the score at 1 and put the Timbers within 12 minutes and stoppage time of advancing. Ozzie Alonso did his usual best to disrupt the Timbers all evening. Yet somehow I knew there would be more twists and turns to occur, and second half stoppage provided several fireworks. After Melano joined the match for Ebobisse just before stoppage, he made an impressive run off a counter with Valeri in control of the ball, and when the space opened up, all Lucas had to do was put it into the net to seal the Sounders' fate. But Sounders goalkeeper Stefan Frei made a spectacularly acrobatic save to stop the effort, and with the Timbers strung forward, Seattle was able to counter back and put the onus on the Timbers defense. The pressure eventually yielded when Ruidiaz got his second goal in the 3rd minute of stoppage, and suddenly, the event that didn't seem likely to happen - extra time - would indeed happen as the teams traded 2 to 1 scores in each venue. Yet Mabiala nearly made that point moot off a late corner kick where the center back put a header on target that Frei just saved in time. And because the match would now be extended, the lifeline of the away goal tiebreaker that Portland had held up until Ruidiaz's second was gone - the match would have to be determined by who scored more goals in the 30 minutes of extra time. Extra time couldn't have started off better for Portland, as Valeri dribbled up the right flank and put a cross to the left post area where Asprilla was waiting. With little cover from the Sounders defense and Frei drifted off towards the left post, Dairon put a header into the right corner that put Portland up 4 to 3 as Asprilla executed a crazy back flip celebration followed by being mobbed by his teammates. Yet the emotions were tested again in the 97th minute off a cross into the Timbers box that struck Blanco's forearm in the melee, and Center Official Jair Marrufo pointed to the spot for a penalty. Yes, it was a very harsh call on Blanco, who appeared to be doing everything possible to avoid handling the ball, but the bouncing and location were enough to award the home side the penalty. When Sounders midfielder Nicolas Lodiero slotted it in past Attinella to even the score at 4 to 4, I had to wonder if there would be any other goals in the final 20 plus minutes of soccer. Both teams had some chances to attack the goal, but when the final whistle blew, it would be a series of penalties that would decided the series winner. Several of the Timbers weren't sure of this development as they were celebrating the result, thinking the 2 away goals would be enough to advance them - not realizing that MLS doesn't observe the away goal rule in extra time. 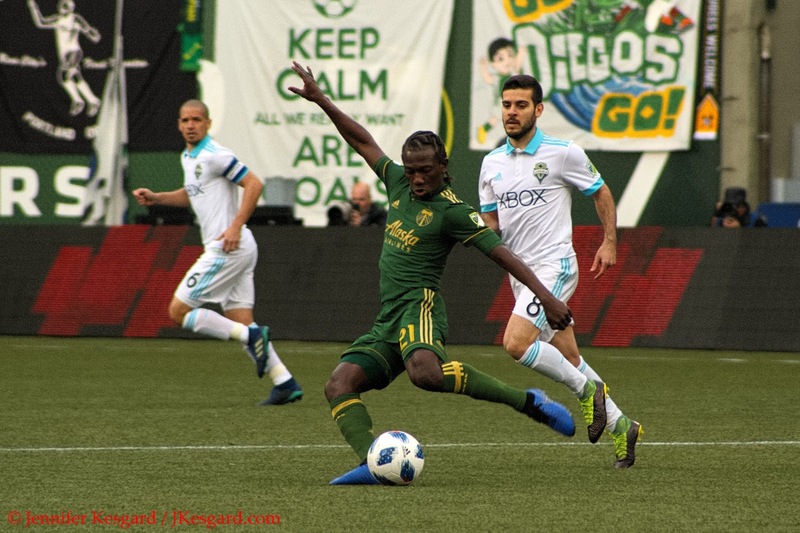 Diego Chara played all 120 minutes against the Sounders without a caution. Penalties can be a cruel way to determine a winner, especially considering how random the results can be when professional soccer players take a shot without any defenders about except the goalkeeper. The exercise becomes one of inspiring enough confidence to take a shot that will challenge the keeper, yet also outguess the opposition in terms of direction and location to give the ball the best chance to score. After Melano and Ruidiaz traded made penalties, Valeri scored his to the left side, putting the onus on Sounders forward Will Bruin. Bruin chose to go left, but his shot went too far left and bounced off the post and out of play. 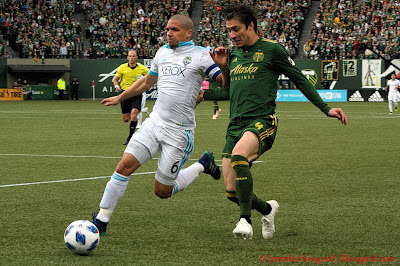 When Blanco converted his, it was up to Sounders midfielder Ozzie Alonso to keep the score close, but his penalty went right and Attinella guessed that direction and pushed it wide right. Ridgewell had a chance to end the festivities at this point, but he chose to go left and Frei charged in that direction to deflect it wide. Sounders midfielder Handwalla Bwana still needed to make his kick to give Seattle a fighting chance, and when he converted it to put the score at 3 to 2, it fell upon Asprilla. Hit the kick, the Timbers advance, miss and the Sounders have a final chance to see if they can tie it up in the initial 5 penalties (best score after 5 wins, otherwise it's sudden death shootout). While Dairon did go in the middle and Frei got an arm to it, it wasn't enough resistance to stop the shot and the Timbers could celebrate victory on rival soil. The celebrations about the advancement have continued throughout the subsequent days, and now Portland can recharge and recalibrate their approach with over 2 weeks between playoff legs. Sporting Kansas City did outlast upstart Real Salt Lake in their 2 leg semifinal, but the normally stout SKC defense had serious issues keeping RSL from scoring goals at points, showing a vulnerability that many haven't seen from this group much this year. Both offenses have to feel confident knowing the regular season meetings between the 2 teams didn't feature fully complete teams, and they have the ability to score goals in bunches. The key deciding factor in this series will fall upon the defense, as it will likely be won by whichever group can provide enough hurdles against the other side to stop them from scoring. The winner of this series will advance to play the winner of the Eastern Conference finals between Atlanta United and the New York Red Bulls, the top 2 points teams in the 2018 MLS Regular Season. The tasks don't get any easier this time of year, but seeing the passion and belief that I've seen from this Portland team, they are going to be an extremely difficult matchup for any of the remaining sides. Experts are predicting it will be SKC in the West with even odds between the Red Bulls and Atlanta advancing, but a lot can happen between now and that December 8 MLS Cup date.